Some top croquet players converge in Ellsworth for the Woodlawn International Croquet Tournament. As boisterous soccer fans converge on Brazil for the international frenzy that is the World Cup, fans of another ball game are - very sedately - cheering on some of their best players - in Ellsworth. The Woodlawn Invitational Croquet Tournament got under way today. 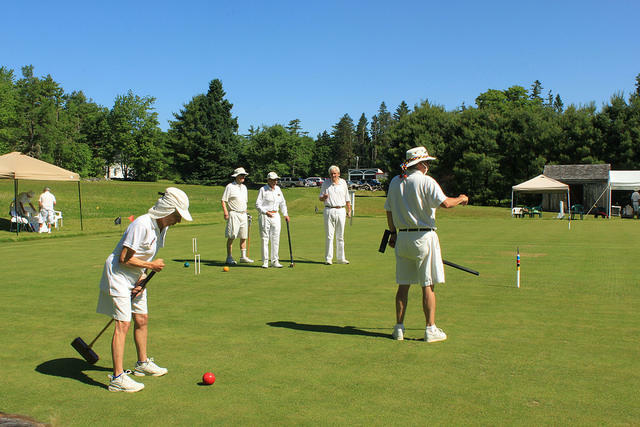 Jennifer Mitchell reports on the Woodlawn International Croquet Tournament in Ellsworth. It's not exactly the furor of a World Cup stadium, or even the quiet patter of a PGA golf course. It's a sound like no other. It's the hushed, contemplative sound of croquet - a game of strategy and geometry in equal measure. "He's going to pull that mallet back with a steady stroke (sighs). 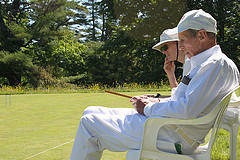 Now we are tied," goes the running commentary of croquet enthusiast Kathleen Dainton, of Gloucester, Massachusetts. With a handicap of about eight, Dainton is well on her way to the highest rung of croquet status. The very best players in the world can have handicaps of 0, and even into the negative numbers. And it's by playing in tournaments such as this one that croquet players improve their national rankings, in much the same way tennis players or golfers establish their standing. But unlike golf and tennis, there are very few regulation-size venues that are sanctioned by the United States Croquet Association. "It's a difficult thing for northern New Englanders to find places to play tournament croquet," Dainton says. "It's very prevalent in the South and in Florida. But this is a top level lawn to play six-wicket, American rules croquet." 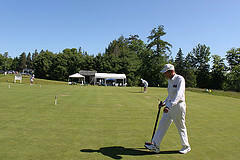 A croquet player devises strategy at the Woodlawn International Croquet Tournament in Ellsworth. American, six-wicket croquet is one of several types that are played, and there's so much special parlance and so many rules, that to explain them all here might be more confusing than helpful. But let's try. The object of croquet is to knock a 1-pound ball with a 3-pound mallet through a labyrinth of wickets and into a center stake. Each player has a colored ball - or a pair of balls, depending on whether it's single or doubles play. Blue and black always play against red and yellow. For singles, a player will have two balls, in doubles a player will have the same color ball throughout the game. Unlike backyard croquet, the wickets are very tight, with leeway of about one thin dime for the ball to slide through. And there are rules on civility: No throwing your mallet, no swearing, no storming off the court, no calling your partner an idiot. In the game of golf, while players utilize a bag full of clubs, croquet players are allowed one mallet but can use it seven different ways to achieve the desired shot. "Croquet to me is like a combination between golf, pool, and chess," says Oakley Johnson. Johnson, who's from Maryland, is about to take the court for his first match of the tournament. The game, he says, can take one from giddy heights to the troughs of depression in an instant. "You can come up with a great strategy, but if you can't exceute, if you can't get the ball through the wicket, if you can't hit another ball with your ball, your strategy fails," Johnson says. "So you have failure and a success all in one turn." While it may require thought and precision, one thing croquet doesn't demand is strength. And this has made it popular with the country's growing elder population. It's not as time consuming as golf, it's easier on the hips, and it's something couples can enjoy together. George Blagden, foreground, takes a turn as time keeper after losing his match. Every single person on the court at the moment has hair in some shade of silver. One of them is 82-year-old George Blagden, a local player, who is just coming off the court from his first match with a devastating loss in overtime play. "At 82 you're sort of over the hill in a lot of sports. But in this sport a lot of it is in the mind, and thinking all the time," Blagden says. "If I'd thought a little harder in the last shot, we might still be playing another overtime. I got a little greedy, and tried to hit too hard, and ruined my only chance. But that's the fun of the game." Although Blagden and his partner wiped out in the first round of doubles, they each have a shot in singles action over the course of the tournament. The championship playoffs are scheduled for Sunday. And in this truly gender and age-neutral sport, it really could be anybody's game.